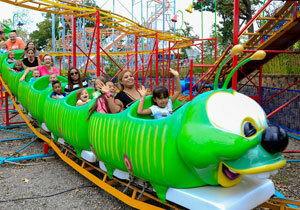 With this Santa’s Village Coupon buy one General Admission Ticket get one 50% off. CLICK HERE to Buy Now! Enter the Coupon Code CFX2018 when prompted to receive your discount. Offer valid for online ticket purchases only. Santas Village Azoosment Park in East Dundee Illinois is open May through October. One admission price includes all activities – 24 rides, shows, interactive animal experiences, exhibits, live entertainment, plus all your favorite fun foods. FREE parking. With over 200 animals, birds and fish along with rides and attractions for all ages, there is something for everyone at Santa’s Village. Santa’s Village has become Chicagoland’s destination of choice for family fun. Now with 24 rides, attractions, animals, live entertainment, all your favorite fun foods, plus plenty of chances to win Big in Game Alley it’s the perfect time to plan your family or group visit. Santa’s Village is conveniently located in East Dundee, IL minutes from I-90. Great for Group Outings. Save $25 When You Book a Birthday Party Package at Santa’s Village & Receive Over $250 in Free Return Tickets! Wow! Great to find a post knoking my socks off! Is this coupon still valid? Can’t open coupon info and the code comes back invalid on the site. Hello, not sure why you were having trouble getting the code to work. We just checked it and it is working. Are you using code CF2018? If you continue to have trouble please let us know. I cannot open the coupon link. Please help. 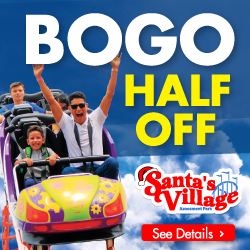 I want buy tickets for Santa’s village but the code for the discount does not work. For the buy one get one 50% off Select the number of tickets then enter promo code CF2018. If you buy two tickets for example, once you enter the code you’ll see it will deduct $12.49.